Amazon Go stores with no queue and no checkout. And, no seriously, they are coming to Europe. Could London be first? 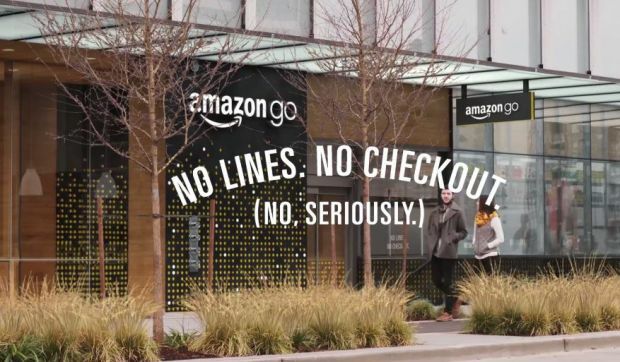 Amazon is preparing to bring its checkout free Amazon Go grocery stores to Europe, as revealed by the approval of trademarks in the UK. The UK Intellectual Property Office last week granted Amazon ownership of the trademarks “No Lines. No Checkout. (No Seriously. )” and “No Queue. No Checkout. (No Seriously. )” A corresponding application is being reviewed by the European Union’s equivalent agency, according to Bloomberg. Amazon Go currently has one physical grocery pilot store in Seattle. It uses Amazon's proprietary 'Just Walk Out Technology' similar to that in self-driving cars – computer vision, sensor fusion and deep learning – in order to automatically detect when products are taken from or returned to the shelves and to keep track of them in a virtual shopping trolley. Once the customer exits the store their Amazon account is charged and they are sent a receipt for the purchases. It is currently being trialled by Amazon employees prior to allowing shoppers into the store. This move by Amazon clearly signals an intent to expand its Amazon Go bricks and mortar trial beyond the US. LZ Retailytics predicts that London would be the most suitable location for a first international store, with perhaps a German city such as Berlin following closely behind. This fits with shopper acceptance of new technology and the locations (its largest international markets) where Amazon has focused its online grocery efforts to date. The 167 sq m Amazon Go store in Seattle is currently being tested by Amazon employees and not yet open to the public. The company has reportedly run into technical difficulties when there are too many shoppers in store at the same time, but this has evidently not deterred Amazon from registering several trademarks, indicating its future rollout plans once the teething problems are resolved. The concern for retailers is that once it is up and running, Amazon will once again reset shopper expectations with its advanced technology and service offering. Retailers are already needing to respond to Amazon Fresh's rapid grocery delivery service in London, as demonstrated by Tesco joining Sainsbury's in trialling a competing one-hour Tesco Now service this week. This time Amazon Go will hit bricks and mortar retail, particularly in the convenience sector. But Amazon has this aspect covered too. According to the UK IPO its patent also covers “business management for others of retail and online retail stores and supermarkets” as well as “advisory and consultancy services”.